Wing sweep at high speeds was first investigated in Germany as early as 1935, but it found no application until just before the end of the Second World War. Swept wings became common on advanced first-generation jet fighters like the MiG-15 and F-86 Sabre, which demonstrated a decisive superiority over the slower first generation of straight-wing jet fighters during the Korean War. Since then, swept wings have become almost universal on all but the slowest jets (such as the A-10). The term "swept wing" is normally used to mean "swept back", but other swept variants include forward sweep, variable sweep wings and oblique wings in which one side sweeps forward and the other back. The delta wing also incorporates the same advantages as part of its layout. 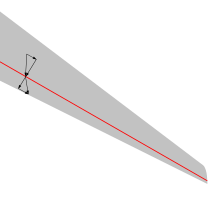 The characteristic "sweep angle" is normally measured by drawing a line from root to tip, 25% of the way back from the leading edge, and comparing that to the perpendicular to the longitudinal axis of the aircraft. Typical sweep angles vary from 0 for a straight-wing aircraft, to 45 degrees or more for fighters and other high-speed designs. Early aircraft adhered to the basic design of square wings at right angles to the body of the machine, but there were experimentalists who explored other geometries to achieve better aerodynamic results. The swept wing geometry appeared before World War I, and was conceived as a means of permitting the design of safe, stable, and tailless flying wings. It imposed "self-damping" inherent stability upon the flying wing, and, as a result, many flying wing gliders and some powered aircraft appeared in the interwar years. One of the earliest swept wing designs was used by José Weiss to construct a swept-wing tail-less glider in 1908 in England. He followed this up with a version powered by an Anzani engine driving two propellers. At the same time the Anglo-Irish engineer J. W. Dunne was experimenting along similar lines, obsessed with achieving innate stability in flight. He was able to successfully employ severely swept wings in his tailless aircraft (which, incidentally, also used washout later on) as a means of creating positive longitudinal static stability. For a low-speed aircraft, swept wings are useful to avoid problems with the center of gravity, to move the wing spar into a more convenient location, or to improve the sideways view from the pilot's position. In 1905 he had already built a glider with swept wings and by 1913 he had constructed successful powered variants that were able to cross the English Channel. The Dunne D.5 was exceptionally aerodynamically stable for the time and the D.8 was sold to the Royal Flying Corps and the United States Navy. His work ceased with the onset of war in 1914, but the idea was taken up by Westland Aircraft in England, who designed a series of gliders and aircraft to Dunne's guidelines, notably the Westland-Hill Pterodactyl in 1931. However, Dunne's theories met with little acceptance from the leading aircraft designers and companies at the time. The Curtiss XP-55 was the first American swept wing airplane, although it was not considered successful. The idea of using swept wings to reduce high-speed drag was developed in Germany in the 1930s. At a Volta Conference meeting in 1935 in Italy, Dr. Adolf Busemann suggested the use of swept wings for supersonic flight. He noted that the airspeed over the wing was dominated by the normal component of the airflow, not the freestream velocity, so by setting the wing at an angle the forward velocity at which the shock waves would form would be higher (the same had been noted by Max Munk in 1924, although not in the context of high-speed flight). Albert Betz immediately suggested the same effect would be equally useful in the transonic. After the presentation the host of the meeting, Arturo Crocco, jokingly sketched "Busemann's airplane of the future" on the back of a menu while they all dined. Crocco's sketch showed a classic 1950's fighter design, with swept wings and tail surfaces, although he also sketched a swept propeller powering it. At the time, however, there was no way to power an aircraft to these sorts of speeds, and even the fastest aircraft of the era were only approaching 400 km/h (249 mph).The presentation was largely of academic interest, and soon forgotten. Even notable attendees including Theodore von Kármán and Eastman Jacobs did not recall the presentation 10 years later when it was re-introduced to them. Hubert Ludewieg of the High-Speed Aerodynamics Branch at the AVA Göttingen in 1939 conducted the first wind tunnel tests to investigate Busemann's theory. Two wings, one with no sweep, and one with 45 degrees of sweep were tested at Mach numbers of 0.7 and 0.9 in the 11 x 13 cm wind tunnel. The results of these tests confirmed the drag reduction offered by swept wings at transonic speeds. The results of the tests were communicated to Albert Betz who then passed them on to Willy Messerschmitt in December 1939. The tests were expanded in 1940 to include wings with 15, 30 and -45 degrees of sweep and Mach numbers as high as 1.21. With the introduction of jets in the later half of World War II applying sweep became relevant. The German jet-powered Messerschmitt Me 262 and rocket-powered Messerschmitt Me 163 suffered from compressibility effects that made them very difficult to control at high speeds. In addition, the speeds put them into the wave drag regime, and anything that could reduce this drag would increase the performance of their aircraft, notably the notoriously short flight times measured in minutes. This resulted in a crash program to introduce new swept wing designs, both for fighters as well as bombers. The Blohm & Voss P 215 was designed to take full advantage of the swept wing's aerodynamic properties; however, an order for three prototypes was received only weeks before the war ended and no examples were ever built. The Focke-Wulf Ta 183 was another swept wing fighter design, but was also not produced before the war's end. In the post-war era, Kurt Tank developed the Ta 183 into the IAe Pulqui II, but this proved unsuccessful. A prototype test aircraft, the Messerschmitt Me P.1101, was built to research the tradeoffs of the design and develop general rules about what angle of sweep to use. When it was 80% complete, the P.1101 was captured by US forces and returned to the United States, where two additional copies with US built engines carried on the research as the Bell X-5. Germans believed based on wartime experience that swept wings were necessary for supersonic flight, and after the war convinced American experts. The British were designing the Miles M-52, a straight-wing design for an attempt on the speed of sound. When the swept wing design came to light the project was cancelled, as it was thought it would have too much drag to break the sound barrier, but soon after the US nevertheless did just that with the Bell X-1. Aircraft designer Sir Geoffrey de Havilland had already begun development on the de Havilland Comet and was considering whether to apply the new swept-wing configuration for the world's first jet airliner. The project engineer on the de Havilland DH 108 was John Carver Meadows Frost, and his aircraft was used as a testing bed for the technology. With only a team of 8–10 draughtsmen and engineers, in 1944 Frost created a remarkable aircraft by marrying the front fuselage of the de Havilland Vampire to a swept wing and short stubby vertical tail to make the first British swept wing jet, soon to be unofficially known as the "Swallow". The D.H.108 first flew on 15 May 1946, a mere eight months after Frost had a go-ahead on the project. Company test pilot and son of the builder, Geoffrey de Havilland Jr., flew the first of three aircraft and found it extremely fast – fast enough to try for a world speed record. On 12 April 1948, a D.H.108 did set a world's speed record at 973.65 km/h (605 mph) and later on became the first jet aircraft to exceed the speed of sound. The Air Ministry introduced a program of experimental aircraft to examine the effects of swept wings (as well as delta wings) and introduced their first combat designs as the Hawker Hunter and Supermarine Swift. The Soviet Union was also intrigued about the idea of swept wings on aircraft at the end of World War II in Europe, when their "captured aviation technology" counterparts to the western Allies spread out across the defeated Third Reich. Artem Mikoyan was asked by the Soviet government, principally by the government's TsAGI aviation research department, to develop a test-bed aircraft to research the swept wing idea — the result was the late 1945-flown, unusual MiG-8 Utka pusher canard layout aircraft, with its rearwards-located wings being swept back for this type of research. When applied to the jet-powered MiG-15, its maximum speed of 1,075 km/h (668 mph) outclassed the straight-winged American jets and piston-engined fighters first deployed to Korea. The American Operation Paperclip reached Braunschweig on May 7 and discovered a number of swept wing models and a mass of technical data from the wind tunnels. One member of the US team was George S. Schairer, who was at that time working at the Boeing company. He immediately forwarded a letter to Ben Cohn at Boeing stating that they needed to investigate the concept. He also told Cohn to distribute the letter to other companies as well, although only Boeing and North American made immediate use of it. In February 1945, NACA engineer Robert T. Jones started looking at highly swept delta wings and V shapes, and discovered the same effects as Busemann. He finished a detailed report on the concept in April, but found his work was heavily criticised by other members of NACA Langley, notably Theodore Theodorsen, who referred to it as "hocus-pocus" and demanded some "real mathematics". However, Jones had already secured some time for free-flight models under the direction of Robert Gilruth, whose reports were presented at the end of May and showed a fourfold decrease in drag at high speeds. All of this was compiled into a report published on June 21, 1945, which was sent out to the industry three weeks later. Ironically, by this point Busemann's work had already been passed around. Boeing was in the midst of designing the Boeing B-47 Stratojet, and the initial Model 424 was a straight-wing design similar to the B-45, B-46 and B-48 it competed with. A recent design overhaul completed in June produced the Model 432, another four-engine design with the engines buried in the fuselage to reduce drag, and long-span wings that gave it an almost glider-like appearance. By September the Braunschweig data had been worked into the design, which re-emerged as the Model 448, a larger six-engine design with more robust wings swept at about 35 degrees. Another re-work in November moved the engines into strut-mounted pods under the wings since Boeing was concerned that the uncontained failure of an internal engine could potentially destroy the aircraft. With the engines mounted away from the wings on struts equipped with fuse pins, an out-of-balance engine would simply shatter the pins and fall harmlessly away, sparing the aircraft from destructive vibrations. The resulting B-47 design had performance rivaling the fastest fighters and trounced the straight-winged competition. Boeing's winning jet-transport formula of swept wings and engines mounted on pylons under the wings has since been universally adopted. In fighters, North American Aviation was in the midst of working on a straight-wing jet-powered naval fighter then known as the FJ-1. It was submitted it to the Air Force as the XP-86. Larry Green, who could read German, studied the Busemann reports and convinced management to allow a redesign starting in August 1945. A battery of wind tunnel tests followed, and although little else of the design was changed, including the wing profile (NACA 0009), the performance of the aircraft was dramatically improved over straight-winged jets. With the appearance of the MiG-15, the F-86 was rushed into combat and straight-wing jets like the Lockheed P-80 Shooting Star and Republic F-84 Thunderjet were soon relegated to ground attack. Some such as the F-84 and Grumman F-9 Cougar were later redesigned with swept wings from straight-winged aircraft. Later planes such as the North American F-100 Super Sabre would be designed with swept wings from the start, though additional innovations such as the afterburner, area-rule and new control surfaces would be necessary to master supersonic flight. The German research was also "leaked" to SAAB from a source in Switzerland in late 1945. They were in the process of developing the jet fighter Saab 29 Tunnan, and quickly adapted the existing straight-wing layout to incorporate a 25 degree sweep. Although not well known outside Sweden, the Tunnan was a very competitive design, remaining in service until 1972 in some roles. The Avro Vulcan, flying at Farnborough, 1958. The introduction of the German swept wing research to aeronautics caused a minor revolution, especially after the dramatic successes of the Hawker Hunter, the B-47 and F-86. Eventually almost all design efforts immediately underwent modifications in order to incorporate a swept wing. 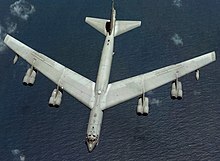 The classic Boeing B-52, designed in the 1950s, continues in service as a high-subsonic long-range heavy bomber despite the development of the triple-sonic North American B-70 Valkyrie, supersonic swing-wing Rockwell B-1 Lancer, and flying wing designs. While the Soviets never matched the performance of the Boeing B-52 Stratofortress with a jet design, the intercontinental range Tupolev Tu-95 turboprop bomber also remains in service today. With a near-jet class top speed of 920 km/h, it is an unusual design in combining swept wings with propeller propulsion and remains the fastest propeller-powered production aircraft. The British designed a range of swept-wing bombers, the Vickers Valiant (1951), the Avro Vulcan (1952) and the Handley Page Victor (1952). By the 1960s, most civilian jets also adopted swept wings. By the early 1950s nearly every new fighter was either rebuilt or designed from scratch with a swept wing. The Douglas A-4 Skyhawk and Douglas F4D Skyray were examples of delta wings that also have swept leading edges with or without a tail. Most early transonic and supersonic designs such as the MiG-19 and F-100 used long, highly swept wings. 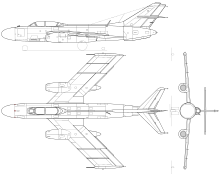 Swept wings would reach Mach 2 in the arrow-winged BAC Lightning, and stubby winged Republic F-105 Thunderchief, which was found to be wanting in turning ability in Vietnam combat. By the late 1960s, the F-4 Phantom and Mikoyan-Gurevich MiG-21 that both used variants on tailed delta wings came to dominate front line air forces. Variable geometry wings were employed on the American F-111, Grumman F-14 Tomcat and Soviet Mikoyan MiG-27, although the idea would be abandoned for the American SST design. After the 1970s, most newer generation fighters optimized for maneuvering air combat since the USAF F-15 and Soviet Mikoyan MiG-29 have employed relatively short-span fixed wings with relatively large wing area. In the transonic phase, the swept wing also sweeps the shock which is at the top rear of the wing. Only the velocity component perpendicular to the shock is affected. As an aircraft enters the transonic speeds just below the speed of sound, the pressure waves associated with subsonic flight converge and begin to impinge on the aircraft. As the pressure waves converge the air in front of the aircraft begins to compress. This creates a force known as wave drag. This wave drag increases steeply until the whole aircraft is supersonic and then reduces. However, shock waves can form on some parts of an aircraft moving at less than the speed of sound. Low pressure regions around an aircraft cause the flow to accelerate, and at transonic speeds this local acceleration can exceed Mach 1. Localized supersonic flow must return to the freestream conditions around the rest of the aircraft, and as the flow enters an adverse pressure gradient in the aft section of the wing, a discontinuity emerges in the form of a shock wave as the air is forced to rapidly slow and return to ambient pressure. With objects where there is a sudden reduction in profile/thickness and the local air expands rapidly to fill the space taken by the solid object or where a rapid angular change is imparted to the airflow causing a momentary increase of volume/decrease in density, an oblique shock wave is generated. This is why shock waves are often associated with the part of a fighter aircraft cockpit canopy with the highest local curvature, appearing immediately behind this point. At the point where the density drops, the local speed of sound correspondingly drops and a shock wave can form. This is why in conventional wings, shock waves form first after the maximum Thickness/Chord and why all airliners designed for cruising in the transonic range (above M0.8) have supercritical wings that are flatter on top resulting in minimized angular change of flow to upper surface air. The angular change to the air that is normally part of lift generation is decreased and this lift reduction is compensated for by deeper curved lower surfaces accompanied by a reflex curve at the trailing edge. This results in a much weaker standing shock wave towards the rear of the upper wing surface and a corresponding increase in critical mach number. Shock waves require energy to form. This energy is taken out of the aircraft, which has to supply extra thrust to make up for this energy loss. Thus the shocks are seen as a form of drag. Since the shocks form when the local air velocity reaches supersonic speeds, there is a certain "critical mach" speed (or drag divergence mach number) where this effect becomes noticeable. This is normally when the shocks start generating over the wing, which on most aircraft is the largest continually curved surface, and therefore the largest contributor to this effect. Sweeping the wing has the effect of reducing the curvature of the body as seen from the airflow, by the cosine of the angle of sweep. For instance, a wing with a 45 degree sweep will see a reduction in effective curvature to about 70% of its straight-wing value. This has the effect of increasing the critical Mach by 30%. When applied to large areas of the aircraft, like the wings and empennage, this allows the aircraft to reach speeds closer to Mach 1. One of the simplest and best explanations of how the swept wing works was offered by Robert T. Jones: "Suppose a cylindrical wing (constant chord, incidence, etc.) is placed in an airstream at an angle of yaw – i.e., it is swept back. Now, even if the local speed of the air on the upper surface of the wing becomes supersonic, a shock wave cannot form there because it would have to be a sweptback shock – swept at the same angle as the wing – i.e., it would be an oblique shock. Such an oblique shock cannot form until the velocity component normal to it becomes supersonic." One limiting factor in swept wing design is the so-called "middle effect". If a swept wing is continuous – an oblique swept wing, the pressure iso-bars will be swept at a continuous angle from tip to tip. However, if the left and right halves are swept back equally, as is common practice, the pressure iso-bars on the left wing in theory will meet the pressure iso-bars of the right wing on the centerline at a large angle. As the iso-bars cannot meet in such a fashion, they will tend to curve on each side as they near the centerline, so that the iso-bars cross the centerline at right angles to the centerline. This causes an "unsweeping" of the iso-bars in the wing root region. To combat this unsweeping, German aerodynamicist Dietrich Küchemann proposed and had tested a local indentation of the fuselage above and below the wing root. This proved to not be very effective. During the development of the Douglas DC-8 airliner, uncambered airfoils were used in the wing root area to combat the unsweeping. Similarly, a decambered wing root glove was added to the Boeing 707 wing to create the Boeing 720. Swept wing and tailplane of a Virgin Atlantic Airbus A340-600. At supersonic speeds an oblique shock exists in front of the leading edge of the wing. The velocity component perpendicular to the shock is different upstream and downstream of the shock. The velocity component parallel to the shock is the same on both sides of the shock. The Convair F-106 Delta Dart is optimized for supersonic flight and has a highly swept delta wing. Airflow at supersonic speeds generates lift through the formation of shock waves, as opposed to the patterns of airflow over and under the wing. These shock waves, as in the transonic case, generate large amounts of drag. One of these shock waves is created by the leading edge of the wing, but contributes little to the lift. In order to minimize the strength of this shock it needs to remain "attached" to the front of the wing, which demands a very sharp leading edge. To better shape the shocks that will contribute to lift, the rest of an ideal supersonic airfoil is roughly diamond-shaped in cross-section. For low-speed lift these same airfoils are very inefficient, leading to poor handling and very high landing speeds. Generally it is not possible to arrange the wing so it will lie entirely outside the supersonic airflow and still have good subsonic performance. Some aircraft, like the English Electric Lightning or Convair F-106 Delta Dart are tuned almost entirely for high-speed flight and feature highly swept wings with little regard to the low-speed problems this creates. In other cases the use of variable geometry wings, as on the Grumman F-14 Tomcat, allows an aircraft to move the wing to keep it at the most efficient angle regardless of speed, although the cost in complexity and weight makes this a rare feature. Most high-speed aircraft have a wing that spends at least some of its time in the supersonic airflow. But since the shock cone moves towards the fuselage with increased speed (that is, the cone becomes narrower), the portion of the wing in the supersonic flow also changes with speed. Since these wings are swept, as the shock cone moves inward, the lift vector moves forward as the outer, rearward portions of the wing are generating less lift. This results in powerful pitching moments and their associated required trim changes. When a swept wing travels at high speed, the airflow has little time to react and simply flows over the wing almost straight from front to back. At lower speeds the air does have time to react, and is pushed spanwise by the angled leading edge, towards the wing tip. At the wing root, by the fuselage, this has little noticeable effect, but as one moves towards the wingtip the airflow is pushed spanwise not only by the leading edge, but the spanwise moving air beside it. At the tip the airflow is moving along the wing instead of over it, a problem known as spanwise flow. The lift from a wing is generated by the airflow over it from front to rear. With increasing span-wise flow the boundary layers on the surface of the wing have longer to travel, and so are thicker and more susceptible to transition to turbulence or flow separation, also the effective aspect ratio of the wing is less and so air "leaks" around the wing tips reducing their effectiveness. The spanwise flow on swept wings produces airflow that moves the stagnation point on the leading edge of any individual wing segment further beneath the leading edge, increasing effective angle of attack of wing segments relative to its neighbouring forward segment. The result is that wing segments farther towards the rear operate at increasingly higher angles of attack promoting early stall of those segments. This promotes tip stall on back swept wings, as the tips are most rearward, while delaying tip stall for forward swept wings, where the tips are forward. With both forward and back swept wings, the rear of the wing will stall first. This creates a nose-up pressure on the aircraft. If this is not corrected by the pilot it causes the plane to pitch up, leading to more of the wing stalling, leading to more pitch up, and so on. This problem came to be known as the Sabre dance in reference to the number of North American F-100 Super Sabres that crashed on landing as a result. The solution to this problem took on many forms. One was the addition of a fin known as a wing fence on the upper surface of the wing to redirect the flow to the rear (see the MiG-15 as an example.) Another closely related design was addition of a dogtooth notch to the leading edge (Avro Arrow). Other designs took a more radical approach, including the Republic XF-91 Thunderceptor's wing that grew wider towards the tip to provide more lift at the tip. The Handley Page Victor had a crescent wing with substantial sweep-back near the wing root where the wing was thickest, and progressively reducing sweep along the span as the wing thickness reduced towards the tip. Modern solutions to the problem no longer require "custom" designs such as these. The addition of leading edge slats and large compound flaps to the wings has largely resolved the issue. On fighter designs, the addition of leading edge extensions, included for high maneuverability, also serve to add lift during landing and reduce the problem. The swept wing also has several more problems. One is that for any given length of wing, the actual span from tip-to-tip is shorter than the same wing that is not swept. Low speed drag is strongly correlated with the aspect ratio, the span compared to chord, so a swept wing always has more drag at lower speeds. Another concern is the torque applied by the wing to the fuselage, as much of the wing's lift lies behind the point where the wing root connects to the plane. Finally, while it is fairly easy to run the main spars of the wing right through the fuselage in a straight wing design to use a single continuous piece of metal, this is not possible on the swept wing because the spars will meet at an angle. Sweeping a wing forward has approximately the same effect as rearward in terms of drag reduction, but has other advantages in terms of low-speed handling where tip stall problems simply go away. In this case the low-speed air flows towards the fuselage, which acts as a very large wing fence. Additionally, wings are generally larger at the root anyway, which allows them to have better low-speed lift. However, this arrangement also has serious stability problems. The rearmost section of the wing will stall first causing a pitch-up moment pushing the aircraft further into stall similar to a swept back wing design. Thus swept-forward wings are unstable in a fashion similar to the low-speed problems of a conventional swept wing. However unlike swept back wings, the tips on a forward swept design will stall last, maintaining roll control. Forward-swept wings can also experience dangerous flexing effects compared to aft-swept wings that can negate the tip stall advantage if the wing is not sufficiently stiff. In aft-swept designs, when the airplane maneuvers at high load factor the wing loading and geometry twists the wing in such a way as to create washout (tip twists leading edge down). This reduces the angle of attack at the tip, thus reducing the bending moment on the wing, as well as somewhat reducing the chance of tip stall. However, the same effect on forward-swept wings produces a wash-in effect that increases the angle of attack promoting tip stall. Small amounts of sweep do not cause serious problems, and had been used on a variety of aircraft to move the spar into a convenient location, as on the Junkers Ju 287 or HFB 320 Hansa Jet. But larger sweep suitable for high-speed aircraft, like fighters, was generally impossible until the introduction of fly by wire systems that could react quickly enough to damp out these instabilities. The Grumman X-29 was an experimental technology demonstration project designed to test the forward swept wing for enhanced maneuverability in 1984. The Su-47 Berkut is another notable example using this technology. However no highly swept-forward design has entered production. Sweep theory is an aeronautical engineering description of the behavior of airflow over a wing when the wing's leading edge encounters the airflow at an oblique angle. The development of sweep theory resulted in the swept wing design used by most modern jet aircraft, as this design performs more effectively at transonic and supersonic speeds. In its advanced form, sweep theory led to the experimental oblique wing concept. Adolf Busemann introduced the concept of the swept wing and presented this in 1935 at the 5. Volta-Congress in Rome. Sweep theory in general was a subject of development and investigation throughout the 1930s and 1940s, but the breakthrough mathematical definition of sweep theory is generally credited to NACA's Robert T. Jones in 1945. Sweep theory builds on other wing lift theories. Lifting line theory describes lift generated by a straight wing (a wing in which the leading edge is perpendicular to the airflow). Weissinger theory describes the distribution of lift for a swept wing, but does not have the capability to include chordwise pressure distribution. There are other methods that do describe chordwise distributions, but they have other limitations. Jones' sweep theory provides a simple, comprehensive analysis of swept wing performance. To visualize the basic concept of simple sweep theory, consider a straight, non-swept wing of infinite length, which meets the airflow at a perpendicular angle. The resulting air pressure distribution is equivalent to the length of the wing's chord (the distance from the leading edge to the trailing edge). If we were to begin to slide the wing sideways (spanwise), the sideways motion of the wing relative to the air would be added to the previously perpendicular airflow, resulting in an airflow over the wing at an angle to the leading edge. This angle results in airflow traveling a greater distance from leading edge to trailing edge, and thus the air pressure is distributed over a greater distance (and consequently lessened at any particular point on the surface). This scenario is identical to the airflow experienced by a swept wing as it travels through the air. The airflow over a swept wing encounters the wing at an angle. That angle can be broken down into two vectors, one perpendicular to the wing, and one parallel to the wing. The flow parallel to the wing has no effect on it, and since the perpendicular vector is shorter (meaning slower) than the actual airflow, it consequently exerts less pressure on the wing. In other words, the wing experiences airflow that is slower - and at lower pressures - than the actual speed of the aircraft. One of the factors that must be taken into account when designing a high-speed wing is compressibility, which is the effect that acts upon a wing as it approaches and passes through the speed of sound. The significant negative effects of compressibility made it a prime issue with aeronautical engineers. Sweep theory helps mitigate the effects of compressibility in transonic and supersonic aircraft because of the reduced pressures. This allows the mach number of an aircraft to be higher than that actually experienced by the wing. There is also a negative aspect to sweep theory. The lift produced by a wing is directly related to the speed of the air over the wing. Since the airflow speed experienced by a swept wing is lower than what the actual aircraft speed is, this becomes a problem during slow-flight phases, such as takeoff and landing. There have been various ways of addressing the problem, including the variable-incidence wing design on the Vought F-8 Crusader and swing wings on aircraft such as the F-14, F-111, and the Panavia Tornado. Theodore von Kármán, first to recognize the importance of the swept wing -Aerodynamics Selected topics in the light of their historical development. Dover publications, New York, 2004. ISBN 0-486-43485-0. ^ a b Hallion, Richard, P. "The NACA, NASA, and the Supersonic-Hypersonic Frontier" (PDF). NASA. NASA Technical Reports Server. Retrieved 7 September 2011. ^ Poulsen, C. M. "Tailless Trials." Flight, May 27, 1943, pp. 556–558. Retrieved: August 1, 2014. ^ "Issue 9 - North American F-86 Sabre: Swept wing technology". Aviation Classics. Archived from the original on 2013-12-03. ^ a b c d e Anderson, John D. Jr. A History of Aerodynamics. New York: McGraw Hill, 1997, p. 424. ^ "Comment by Hans von Ohain during public talks with Frank Whittle, p. 28." Archived 2007-12-09 at the Wayback Machine ascho.wpafb.af.mil. Retrieved: August 1, 2011. ^ a b c d Meier, Hans-Ulrich, editor German Development of the Swept Wing 1935–1945, AIAA Library of Flight, 2010. Originally published in German as Die deutsche Luftahrt Die Pfeilflügelentwicklung in Deutschland bis 1945, Bernard & Graefe Verlag, 2006. ^ Hermann Pohlmann; Chronik Eines Flugzeugwerkes 1932–1945, 2nd Impression, Motorbuch, 1982, pp. 190-193. ^ "Wing Planforms for High-Speed Flight." NACA TN-1033. Retrieved: July 24, 2011. ^ Goebel, Greg. "The SAAB 29 Tunnan." Air Vectors. Retrieved: August 1, 2011. ^ Sears, William Rees, Stories form a 20th-Century Life, Parabolic Press, Inc., Stanford California, 1994. ^ Shevell, Richard, "Aerodynamic Design Features", DC-8 design summary, February 22, 1957. ^ Dunn, Orville R., "Flight Characteristics of the DC-8", SAE paper 237A, presented at the SAE National Aeronautic Meeting, Los Angeles California, October 1960. ^ Cook, William H. The Road to the 707: The Inside Story of Designing the 707. Bellevue, Washington: TYC Publishing, 1991. ISBN 0-9629605-0-0. ^ "Supersonic Wing Designs." selkirk.bc.ca. Retrieved: August 1, 2011. ^ "Supersonic Wing design: The Mach cone becomes increasingly swept back with increasing Mach numbers." Archived 2007-09-30 at the Wayback Machine Centennial of Flight Commission, 2003. Retrieved: August 1, 2011. ^ Haack, Wolfgang. "Heinzerling, Supersonic Area Rule" (in German), p. 39. Archived 2009-03-27 at the Wayback Machine bwl.tu-darmstadt.de. ^ "Forward swept wings." Homebuiltairplanes. Retrieved: August 1, 2011. Wikimedia Commons has media related to Wing sweep. This page was last edited on 7 March 2019, at 15:15 (UTC).